SKU: BUCK-SCTHIS. Categories: Belts & Accessories, Buckles, Keepers & Tips. According to Scottish legend, a Viking king and his raiders were attempting to attack a party of Scottish warriors under cover of darkness. To avoid noise, the king ordered his band to remove their footwear. Unfortunately, one of the attackers stood on a prickly thistle and shrieked in pain. The clansmen were alerted of the attack and Vikings were duly defeated by the Scots. Channel the strength of this hardy plant with our Scottish Thistle Belt Buckle! The buckle fits most 1.5″ belts and is available in both bronze and sterling silver. 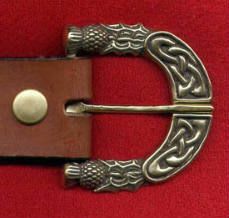 Get a belt to go with your Thistly Buckle: a Viking Rune belt, a Celtic Knotwork Belt, aor a Celtic Spirals Belt.